There are practically countless ways and permutations of how a site can be configured in regards to publishing, especially starting in Movable Type 4.2 in which we introduce the ability to select on a template by template and archive map by archive map basis. This document should provide an overview of how you can configure your templates, as well as an overview of the various strategies you might consider deploying. Movable Type provides a simple wizard to help you configure how each of your templates will be published in a single batch operation. This wizard is accessed by clicking the “Use Publishing Profile” link the sidebar found on the right hand side of your template listing screen. This wizard allows you to select from the following profiles. Note: Templates and template maps with a publishing options of “Manual” or “Disabled” will be ignored by this wizard. The assumption being that once a template has been disabled in someway, one would not want them to be re-enabled through this wizard. This option is the default publishing profile. This instructs Movable Type to publish whatever files it deems necessary in a single, blocking publishing operation. In this mode, a person leaving a comment must wait until all the files that need to get published are updated. Once that operation is complete, the commenter will be redirected back to the page they left the comment on. The same is true for admins. When an author creates a post and publishes it, this mode will require that author to wait while all the files relating to that post are created and/or updated. In this profile all files are published in the background. This mode requires that you have Publish Queue enabled, and that you have a cron job setup on your system to process files that offloaded to be processed by the Publish Queue. This profile is recommended for sites of considerable scale, or sites that require a large number of files to be published in response to new entry or comment. The purpose of this profile is to publish your less critical files, those files that do not need to be as up to date as others. This profile is recommended for sites in which the freshness of the home page and the freshness of your entry archives are paramount. Note: This profile requires that you be running Publish Queue. See notes above. This profile will instruct Movable Type to publish all files dynamically. In this mode, no files are written to the file system. Content is served directly from the database in real time. This is more than a viable publishing option for most sites. However, sites of scale, and sites that need the assurance that a spike in traffic will not render content unreachable may consider using a mix of static publishing and other options. 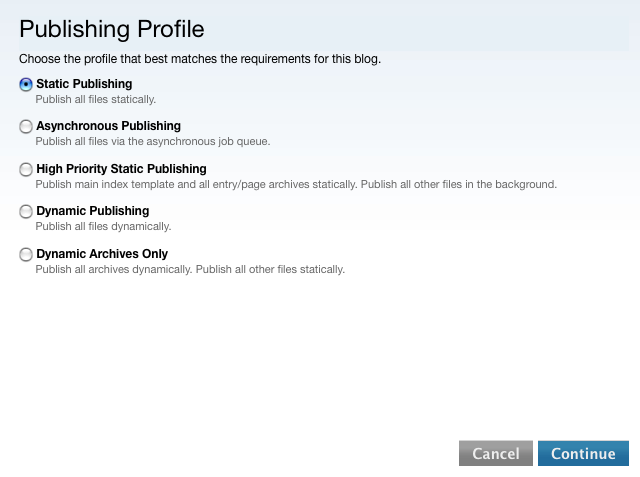 This is similar to the dynamic publishing mode above except that only your archives will be published dynamically. Selecting “Disabled” will cause these templates or template mappings to be ignored during all publishing processes. 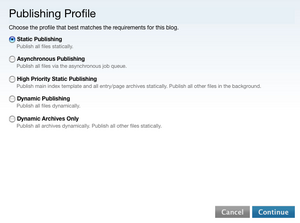 The profiles above are merely convenient ways to set your publishing options across all of your templates in one batch operation. Once your settings have been made you can customize your settings further by editing each template, or each template map separately. Consider publishing your various date based archives asynchronously. There is often not a considerable amount of demand that these be updated immediately upon a change. Set your individual entry archives to publish statically as they are often one of your most critical pieces of content. Turn off author archives if there is only one author in the system.